Think Positively Poster Pack is durable and reusable. 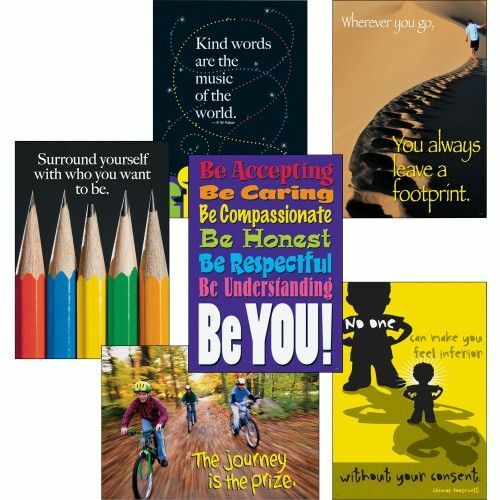 Create motivational displays with six eye-catching, posters that reinforce positive behavior and promote character development. One poster features colorful, sharpened pencils and the message, "Surround yourself with who you want to be." Another poster simply features the message, "Be Accepting Be Caring Be Compassionate Be Honest Be Respectful Be Understanding Be You!" in colorful letters. A third poster depicts a person walking in sand leaving footprints and reads, "Wherever you go, you always leave a footprint." A fourth poster with "No one can make you feel inferior without your consent" has two figures facing off, and the smaller one has a muscled shadow and a radiant face. A fifth poster displays talking figures emitting colorful streams with the message, "Kind words are the music of the world." The last poster has bicycling children having fun, and reads, "The journey is the prize." Ideal for prekindergarten to ninth-grade.